On Saturday, April 28, 2018, Young Invincibles (YI) hosted our inaugural State of California Millennials (SOCM) Summit. The summit convened millennials, elected officials, and thought leaders from across California at Cal State Dominguez Hills for a half-day summit dedicated to unpacking the critical issues and challenges facing the young adult community today. The program included panels, talks, workshops and forums–all envisioned, developed and moderated by the members of YI’s California Youth Advisory Board (YAB). We launched SOCM with a Future Speak panel featuring young adult elected officials: Mayor of Compton, Aja Brown, Covina Council Member Jorge Marquez, Vice Mayor of Long Beach Rex Richardson and City of Walnut Councilman Andrew Rodriguez. Shaneice Simmon from Rock the Vote co-facilitated the panel with YAB member, Alfredo Camacho-Gonzalez and they closed the panel with the first call-to-action: Californian’s deadline register to vote for the primaries is May 21st, 2018. Young adults can register to vote or update their registration here. The young elected’s panel was followed by two “What’s Equity got to do with it?” talks led by Dr. Christopher Nullem, Senior Director of Higher Education Research and Policy for Ed Trust-West and Katie Selenski, Executive Director of Cal Savers and moderated by YAB member, Eric Medrano. Katie set the record straight that Millennials today have to work 14 times the hours compared to the boomer generation of minimum wage work to pay for 4-years of public college. Our equity talks were followed by 3 breakout sessions on (1) health care advocacy, (2) data reform, and (3) community organizing. Jenita Igwealor of Townhall Project and long-time friend of Young Invincibles, led an inspiring session to a full-house of young adult leaders on moving From Passion to Action: Organizing Young Adults in 2018. The final forum of the summit was led by Campaign for College Opportunity Regional Affairs Director, Linda Vasquez, and YAB member, Cody Hounanian. 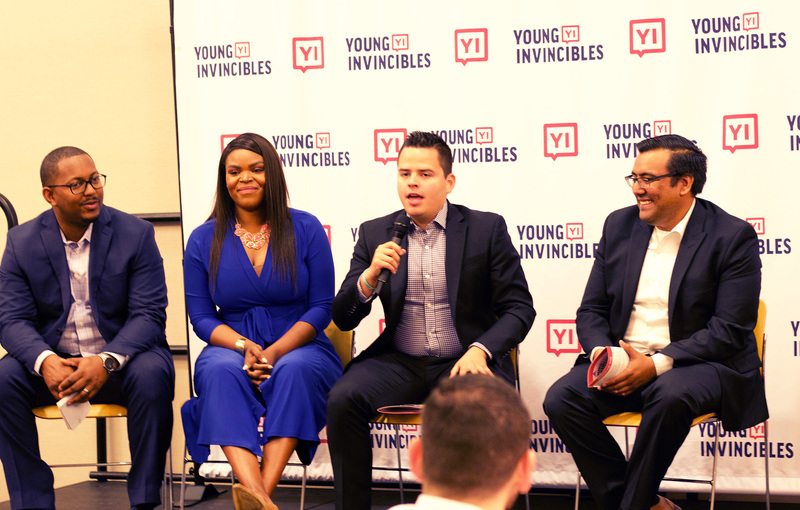 This was a highly anticipated panel for YI’s base of supporters featuring the Lieutenant Gubernatorial Candidate’s: David Fennell, Cameron Gharabiklou, David Hernandez and Gayle McLaughlin and the conversation did not disappoint. We closed the event with Kristin McGuire, Director of Partnerships and Organizing, announcing that YI is set to launch a statewide Millennial coalition in the fall that will prioritize elevating young adult voices in Sacramento and throughout the state. If you are interested in joining our coalition, please email: kristin.mcguire@younginvincibles.org. We want to recognize the sponsoring partners that made SOCM possible: The California Endowment, Campaign for College Opportunity, SEIU 721, Jenner & Block, The Water Replenishment District of Southern California, Reddock Law Group, Kathleen Selke and Wes Griffith. We also want to send a giant thank you to all of our Millennial Advisory Board Members of #YIWest.